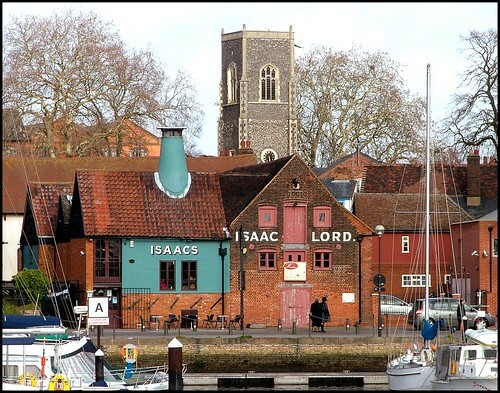 Ipswich port has a longer history than just about any other port in England, and its dockland area has been populated longer than any other English town. 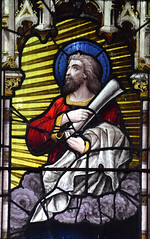 St Clement, the patron saint of seafarers, was a perfect choice of patron for this, the largest of the dockland churches. The parish has been inextricably linked with seafarers for over a thousand years. Ipswich town centre has twelve medieval churches, and there are others out in the suburbs, but as with any industrial town, the changing population patterns of the last half a century have meant that some of the parishes ended up with no resident population. 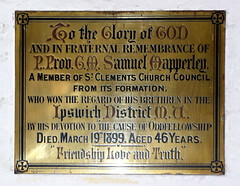 St Clement was always the largest, poorest and most populous of Ipswich's parishes. But 20th Century slum clearances and the taking over of the waterfront by industry led to the population's decline, and then of course the industry itself began to disappear. By the 1970s, six of the town centre churches had been declared redundant, and it was a long, slow grind before reuses were found for many of them. At the start of the 21st Century, five of them still stood abandoned and, in some cases, near derelict, because the presumed 'wholly commercial' reuses had not emerged. Gradually, the optimism and public finance of the first decade of the century drew four of these into community reuses, until at last only St Clement remained. And yet, St Clement has the finest setting of all the dockland churches, despite the one-way system passing within ten metres of its north side. The road was built over that part of the churchyard which adjoined the ironworks, which still survives across the road. Seen from this road, the handsome church is stately among its great trees. The clutter of small buildings that have surrounded it for hundreds of years have been cleared away, opening up a fine view from the west. 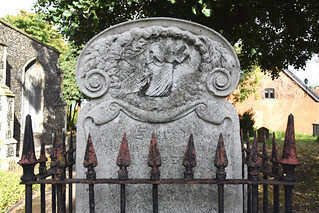 Until the 1960s the graveyard was almost completely enclosed, accessible only by the footpath which still survives coming from Grimwade Street beside the former parish hall. Approached along this path, the church is a secretive giant, rising shyly among the overgrown trees. The church itself is a fine example of fairly late perpendicular church-building, with a grand tower and as magnificent a clerestory as any of the Ipswich churches. 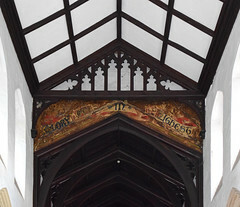 The chancel was the work of that ubiquitous Ipswich architect Frederick Barnes. For a long time, the view from the outside has been all you are able to see. 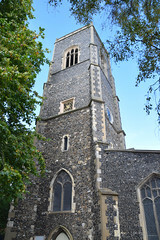 The church was declared redundant in the early 1970s, and has been closed ever since, the largest of all Ipswich's redundant churches. In the 1980s, it was the victim of a great deal of vandalism because of its position, relatively isolated from mainstream town life. The sheltered south side of the churchyard in particular became littered with the kind of things that you wouldn't want your children to pick up. The church itself became a prop-store for the Wolsey Theatre, and it was surreal indeed to walk among the fibre-glass cannons, cardboard grandfather clocks and Scottish warrior outfits that were stacked high in the nave and aisles. The church was left pretty much as it was on the day it closed, as if the churchwardens had put away the hymn books and slipped out after that final Evensong. However, in 1996 a disastrous fire swept though St Clement, completely destroying the 1880s roof. 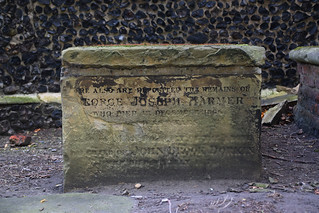 This was soon rebuilt, and, combined with a clear-up for the churchyard came landscaping and a memorial to a famous mariner son of the parish, Thomas Slade. The former Suffolk College took on the lease on the building, but gave notice in 2001 that they would not be renewing it. 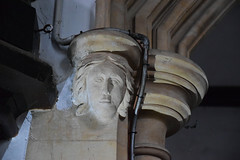 The late John Blatchly, of the Ipswich Historic Churches Trust, told me at the time that there was a potential commercial user interested in taking it on in the future, but I thought it unlikely that this would happen. Visiting it at the time, I found this big church disarmingly bare, with a slight air of dereliction. In fact, the former congregation here kept a weather eye on it, still opening it up on Historic Churches Bike Ride day, which was more than could be said for some of the other redundant Ipswich churches. The redecoration and rebuilding of the roof after the fire had made it sound, and it was obvious that it wouldn't be too difficult to convert the building for an appropriate use - as a concert space, perhaps, or even for one of the new evangelical churches. I wondered if even the Catholic Church might take a look, since they don't possess a large worship space among their five Ipswich churches, which are often overcrowded. Coming back here in 2005, I was pleased to discover that the interior had been spruced up. The royal arms, which fortunately survived the fire, are probably the best example of Ipswich's familiar Charles II sets. 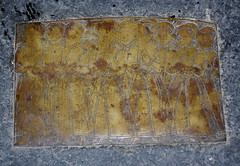 These are different to the others in that they are carved and gilded rather than being painted on boards or canvas. 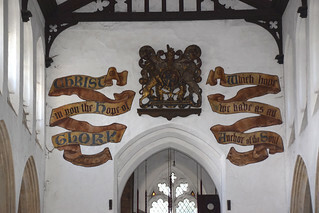 The wall beside them above the tower arch is resplendent with 19th Century scroll work. 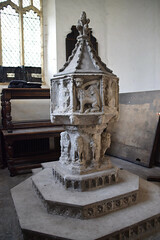 The font, reset by the Victorians in the westward extension of the south aisle, is a typical East Anglian rural 15th century font, with angels on the bowl and lions and wild men around the stem, giving a rustic air to this corner. 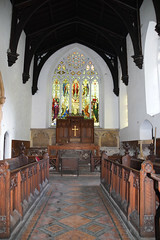 The church suffered considerable blast damage during the Second World War, only four of the stained glass windows surviving. Remarkably, there is still a small former bomb site to the south-west of the church beside the Lord Nelson pub. 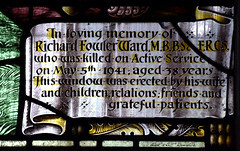 After the war, the damaged east window was replaced by a striking depiction of the Ascension by Abbott & Co of Lancaster, a memorial to a local doctor killed in the Second World War. The glass on the south side of the chancel depicting the Nativity and the Annunciation is by Ward & Hughes, and is good for the workshop. 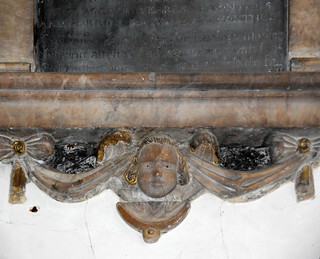 That of the Presentation in the Temple at the east end of the south aisle is by Powell Brothers of Leeds, also good. 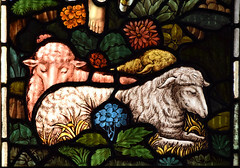 Ward & Hughes' Transfiguration in the north aisle is perhaps less good, and the Good Shepherd window by Ide & Sons of London in the south aisle is rather spoilt by the cartoony central figure of Christ. 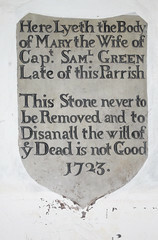 St Clement is remarkable for the quantity of its memorials, and the quality of some of them. 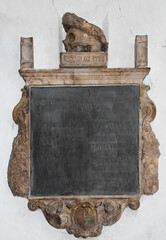 The best is probably that to John Ward, rector here throughout the Commonwealth period and beyond the Restoration. 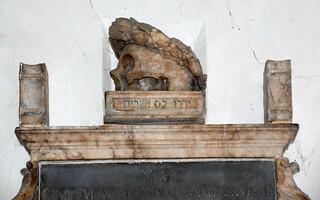 It was reset in the chancel along with a number of the others by the Victorians, and John Blatchly credited it to the Danish sculptor Caius Cibber, who was a great favourite of the English court. 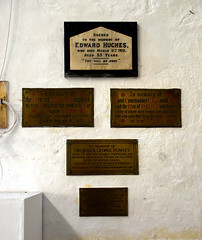 There was an enthusiasm here in the early part of the 20th Century for small memorial plaques, mostly produced by the Scott & Co Foundry of Ipswich, commemorating those lost at sea. This extended into the first years of the Great War, after which the sheer magnitude of losses seems to have put a stop to the project. 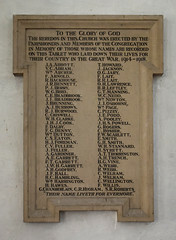 The bleak reredos serves as a parish war memorial, the names of the lost on a tablet on the west wall. All too easily, this church could have been lost to dereliction and vandalism. 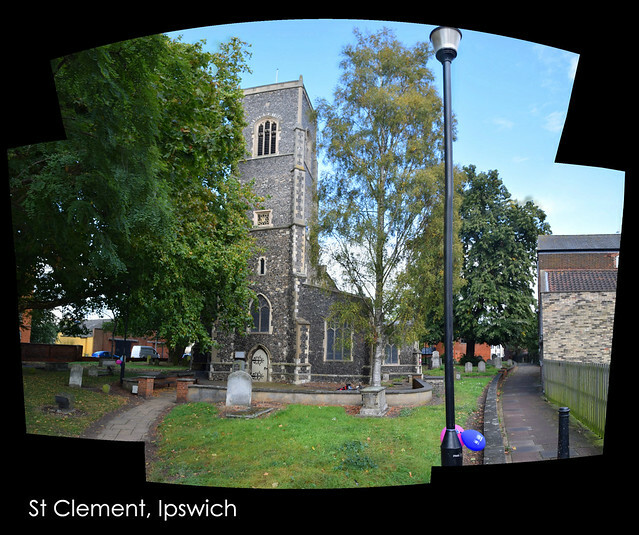 As it was, St Clement stood still while Ipswich changed around it. The 1960s demolition of virtually all of the housing in the parish that had led to its redundancy was effectively redressed by the massive Waterfront regeneration, the almost complete rebuilding of Ipswich's wet dock area. St Clement now has many new neighbours, and most of them are residential. St Clement sat and waited, as patiently as it had done for the previous thirty years, but perhaps with more hope. Similarly, the Diocese had moved away from its 1970s policy of redundancy, and went into the business of creating benefices, groupings of parishes that shared ministers and resources. Back in the 1830s, Holy Trinity a few hundred metres to the east had been built as a chapel of ease to St Clement. This, in turn, had seeded St Luke on Cliff Lane. 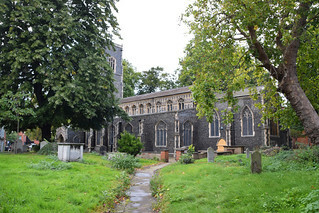 Like St Clement, Holy Trinity had lost almost all of its parish population, but instead of being declared redundant it was grouped into a benefice with St Luke and St Helen on St Helen's Street. For a time, the benefice took St Clement under its wing again. 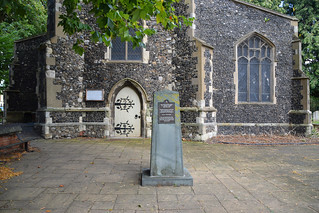 The church remained redundant, and was not used for regular worship, but the benefice used it for events, and in 2005 the the nave was full of seating, which any Ipswich resident would have recognised as some of the chairs formerly in the Corn Exchange. And so it went on, St Clement attracting plenty of attention, but no permanent reuse. And yet it was clear that this fine, sound building had a role to play. 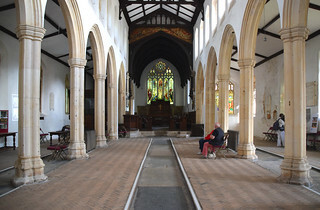 St Clement is perfectly suited to the kind of performance and arts events that its new neighbours might attract, a community function in keeping with the proclaimed mission of the Diocese rather than being reused for what the Ipswich Historic Churches Trust had hoped would be 'wholly commercial' purposes. 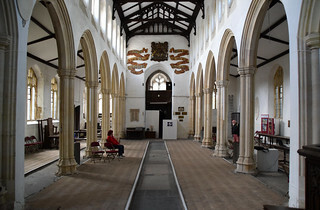 And so it was in 2015 that the building was chosen as the venue for the long awaited Ipswich Arts Centre project, designed to have a similar scale and function to the Colchester Arts Centre, which is also in a redundant church. It is hoped that work will begin in 2018. 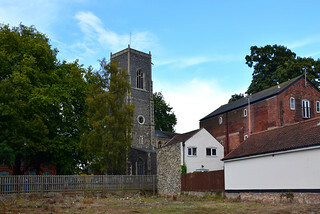 The involvement of the Borough Council and the University of Suffolk in the project leads to the further hope that, after almost half a century of waiting, the redundant medieval town centre churches of Ipswich might at last all have found permanent community reuses.